Offering breakfast Wi-Fi parking and a ski (and casino) shuttle â?? all free â?? 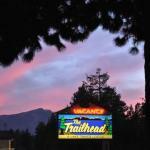 plus bargain-basement rates the Vagabond Inn South Lake Tahoe is a real find for our guests. The two-story exterior-corridor hotel has 32 rooms with microwaves mini-fridges and cable TV with HBO. Wi-Fi and local phone calls are free. Some rooms have jetted tubs. Non-smoking rooms are available. Before heading out to work or play enjoy a free continental breakfast and a free weekday newspaper. After a day on the slopes or on the lake relax in the outdoor pool or hot tub. The hotel provides fax services and free parking. Pets are welcome for an extra fee. Two minutes from the Nevada border the hotel is located on Highway 50. The Horizon Casino and Harvey's Lake Tahoe Casino are less than a mile away. It's about a mile to the Bijou Municipal Golf Course and two miles to Heavenly Mountain Ski Resort and Thomas F. Regan Memorial City Beach. Reno Tahoe International Airport is a 55-mile drive north.